Horus Of all the gods of Egyptian mythology the most complex and potentially confusing for us today is Horus God . One Egyptologist from the turn of the century identified fifteen different forms of this god, and Siegfried Morenz also found fifteen, not necessarily the same ones. The main forms were probably Ra-Herakhty, Horus God the Elder, Horus God the Younger, and Horus God the Child. Ra-Herakhty was a form of the sun god, a combination of Ra and Horus God who represented the morning sun. 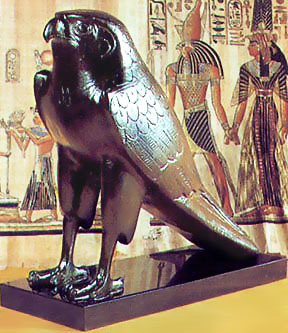 Often shown in falcon form or in the shape of the winged disk, Horus God the Elder was worshipped from Heliopolis to Abu Simbel. He can be considered the fifth child of Geb and Nut, making him another brother of Isis and Osiris. Some have thought that he might be the son of Hathor, but in that case his paternity is in doubt, although Ra is some- times so mentioned. Horus God the Younger should be considered the son of Isis and Osiris, the god who avenged his father’s murder and replaced him on earth, the hero of the war with Seth to be told in the next chapter. Horus God the Child was another version of Horus God the Younger, but he was given a distinct depiction. Called Harpocrates by the Greeks, he was prominent during the Graeco-Roman period, long after the other forms of Horus God . Horus God the Child was usually shown as a boy, wearing the side lock of a youth and sticking his finger in his mouth. At the height of his popularity he was often commemorated on small bronze plaques, called cippi of Horus God , where he was shown standing on crocodiles and holding scepters or other signs of authority. 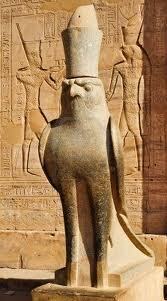 I am Horus God ; the Falcon who is on the battlements of the mansion of him whose name is hidden. My flight aloft has reached the horizon, I have over passed the gods of the sky, I have made my position more prominent than that of the Primeval Ones. My place is far from Seth, the enemy of my father Osiris ... I go up in flight and there is no god who can do what I have done I am Horus God , born of Isis whose protection was made within the egg. It was in the Coffin Texts that the images of Horus God as the falcon and as the son of Isis merged, according to R. T. Rundle Clark. As we have seen in the myth of his birth, he was usually depicted as a humanlike child in need of his mother Isis’ nursing and protection, but in other versions he was depicted not as a child but as a falcon. During pregnancy Isis knew that her baby was unusual and told Atum “it is a falcon that is within my body.” When the baby was born, he took flight while his mother immediately began to negotiate a seat for him in the solar boat. In this version Horus God did not grow up hiding from Seth among the papyrus rushes of the Delta, but immediately assumed his place as a powerful god. Regardless of which myth is followed, as an adult Horus God became one of the most powerful and important gods. He was first and foremost a sun god, and the replacement of Osiris here on earth, with a place in the solar boat as its pilot and steersman.